The Hague, Netherlands (15 September 2016) – Catarina de Albuquerque of Portugal has been named the winner of the 2016 IWA Global Water Award. The award recognises the exceptional role she has played as the driving force behind the recognition of the Human Rights to Water and Sanitation. From 2008 to 2014 Catarina de Albuquerque became the first United Nations (UN) Special Rapporteur on the right to safe drinking water and sanitation, having played a pivotal role in the recognition of water and sanitation as human rights by the UN General Assembly in 2010. Her work helped ensure the rights to water and sanitation were incorporated into the formal Sustainable Development Goals 2015-2030 document approved by the UN General Assembly. The only human rights explicitly mentioned. This followed a four-year period during which she presided over the negotiations of the Optional Protocol to the International Covenant on Economic, Social and Cultural Rights at the United Nations – a treaty allowing people to bring complaints regarding human rights violations against their governments to the UN. 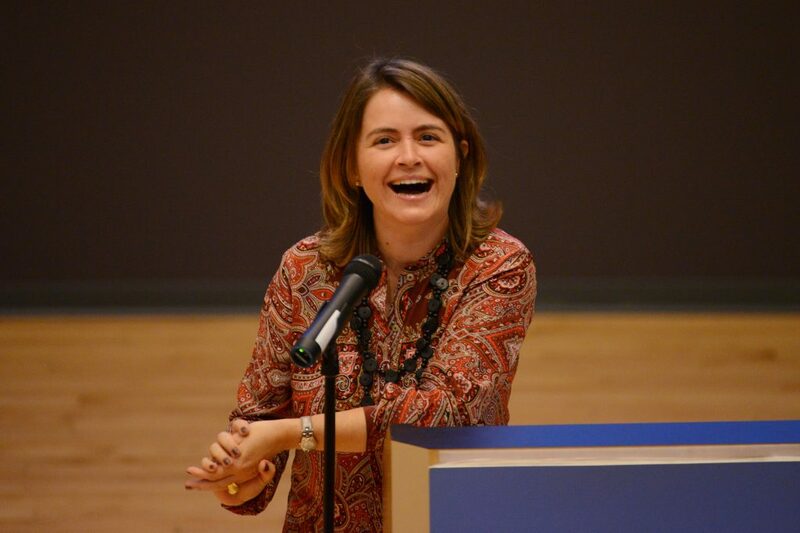 After successfully completing her second and final term as UN Special Rapporteur in December 2014, Catarina de Albuquerque was appointed Executive Chair of Sanitation and Water for All (SWA) global partnership which has the objectives of achieving universal access to clean water and adequate sanitation for all, always and everywhere. Catarina de Albuquerque is continuing her work to implement the human rights to water and sanitation. Talking about her work, Catarina de Albuquerque said, “I’m honored to receive this award from within the water community, it will raise awareness of the critical water and sanitation needs of billions of people. As a teenager I did volunteer work in the then existing Lisbon slums. I was profoundly disturbed by the injustices and inequalities I saw. Since then I felt that I wanted to contribute to changing the world and the underlying causes of the injustices I saw”. It is estimated that, globally, almost one third of the world’s population – some two and a half billion people – live without adequate sanitation facilities. Additionally, 663 million people still do not have access to an improved source of safe drinking water. Of course many more do not have access to water and sanitation that meets the human rights requirements. The health, economic and societal impact of this is immense: 842,000 deaths each year are caused by unsafe water and a lack of sanitation; millions of women and girls are excluded from education and productive work because they have to walk long distances to collect water; the associated cost to the global economy is $260 billion annually. The IWA Global Water Award will be presented to Catarina de Albuquerque during the opening ceremony of the IWA World Water Congress, held in Brisbane, Australia, 09 October 2016. Ms. de Albuquerque was an invited Professor at the Law Faculties of the Universities of Braga and Coimbra (Portugal) and a Senior Legal Adviser at the Office for Documentation and Comparative Law, an independent institution under the Portuguese Prosecutor General’s Office for 20 years. She was awarded the Human Rights Golden Medal by the Portuguese Parliament (10 December 2009) for outstanding work in the area of human rights. Her work in human rights was also honoured by the Portuguese President of the Republic (October 2009) with the Order of Merit, which is a recognition of an individual’s personal bravery, achievement, or service. She holds a Law Degree from the Law Faculty of the University of Lisbon (Portugal) and a DES from the Institut Universitaire de Hautes Etudes Internationales (Geneva, Switzerland). The International Water Association is the largest international network of water professionals working towards a water wise world, with members in more than 130 countries. Its work focuses on developing solutions for water and wastewater management. As a knowledge hub for the latest science, technology and best practice in the water sector at large, the IWA works to place water on the global political agenda and to influence best practice in regulation and policy making.